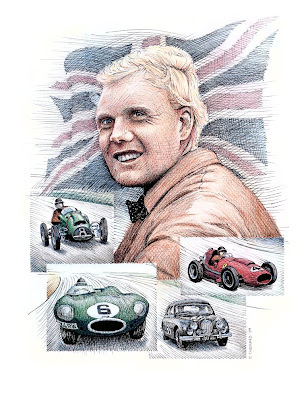 John Michael “Mike” Hawthorn was a well-liked British racecar driver from Farnham. He was popular, and fun-loving, almost always sporting his trademark bowtie, even when racing. His father Leslie owned own and operated the Tourist Trophy Garage and Mike spent most of his spare time working in his father’s garage, located close to the Brooklands race track. He started racing motorcycles with some success, and in 1950, raced automobiles, also with success. In 1951, he graduated to a Formula 2 Cooper-Bristol that his father bought. His racing prowess caught the attention of Jaguar’s Lofty England and Enzo Ferrari. Hawthorn was offered a contract with Ferrari and signed up for 1953. His first F1 win came in the 1953 French Grand Prix at Reims, driving a Ferrari 500. Though less consistent and successful than others, he won 4 pole positions and 3 Grand Prix races in 45 starts. In 1958, he won only one race, but place 2nd in five races, allowing him to take the Formula 1 Driver’s Championship. After winning, Hawthorn immediately announced his retirement from Formula 1 to pursue his business interests. Sadly, less than a year later, he was killed in an automobile accident. Note: The sketch above is available as a 11"x 14.5" limited edition of 50 signed/numbered archival Giclee print for $150 USD each plus shipping/handling.